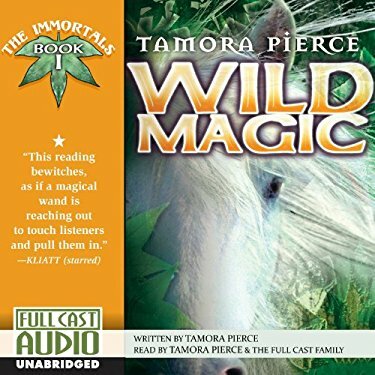 "Wild Magic" is the first book of a quartet of books in the Immortals Series by Tamora Pierce. The story deals with Veralidaine (aka Daine), a thirteen-year-old girl who just survived a raid on her village that left her family dead and her alone. We first meet her looking for a job. We quickly learn that she has a way with animals and is a good shot with a bow. Her human skills leave a little to be desired and she is carrying a dark secret. In the world around her, we learn that monsters, the immortals, are coming back after being locked away in the lands of the gods. She and her new friend/boss Onua encounter "Stormwings", which are like an advanced form of a harpy and giant spiders. Along the way, we learn that while Daine's mother was a hedge-witch she has no magical "gift" herself, but there is something more that normal with the way she can interact with animals. Daine grows in her power under tutelage from a university trained mage while she is working as assistant horse-mistress to the Queen's Riders. Here we learn her magic is the rarest, Wild Magic, and there might not be any limits to what she can do. We do learn of her dark secret (and it pays off) and we see her grow from a shy child to a strong and capable young woman. I read this book a long time ago, but I don't think I finished it. Given the time I was in grad school and likely busy reading Vygotsky and Dewey too. Also, I remember the ending different. I picked up the Full Cast audio book of this and it was very pleased. It was like a mini performance. Some reviewers mentioned that keeping track of the character voices was tough, but I found it easy to be honest. I was not going to pick up the next three books, remembering that this one pretty self-contained, but now I am going to. I also enjoyed having Pierce as one of the narrators. It is nice to hear the definitive pronunciation of some of the names, even if they were sometimes very different than how I had read them! There are very, very few monsters in this story. The ones that are here make a huge impression. This is something that fantasy game masters should take a cue from, that when you are 1st level EVERY monster needs to be a memorable experience. The Stormwings, which are essential harpies with metal wings, are a serious threat to 13-year-old Daine. Also, there is the underlying theme of magic can do wonderful things, but it by itself can't fix your problems. It's the old adage that when your only tool is a hammer everything starts looking like a nail. Witches in this book: Daine, but only because her magic is so very different than everyone else's. Are they Good Witches or Bad Witches: There are clear lines between good and evil here. Best RPG to Emulate it: Another easy one. This is very clearly Blue Rose. Daine is an Adept that has taken all the animal related arcana. Use in WotWQ: There are a lot of great ideas for games as mentioned above. The idea of a new, or rather really old and forgotten, type of magic is just too good to pass up. I also like the idea of new and scary monsters coming into or back into the world as a prelude to something terrible happening.